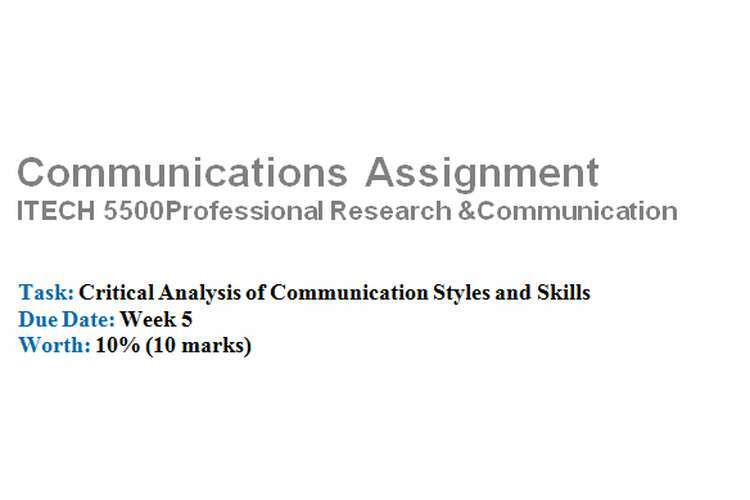 The purpose of this assignment is to enable students to evaluate professional communication aspects in relation to the communication styles, skills and effectiveness, and to demonstrate the ability to critically analyse and communicate the key issues through a written report. 3. You are then required to carefully note issues on their communication styles, skills and effectiveness. You need to perform a critical analysis on the individual, highlighting the positive and negative aspects of their communication styles, skills and effectiveness.For example, such things may include verbal and non-verbal communication, level of animation, logical sequence of statements, how they deal with criticism (if applicable), depth of lectures/answers/rebuttals, ability to convey their message etc. In any case, you must support your analysis with theories and concepts from other authenticated sources of information (books, journal articles, other online materials etc.) on communication styles, skills, and effectiveness. 4. Finally you are required to present a written critical analysis of 1000-1500 words in report format. e) The conclusion that draws together your critical analysis of the overall investigation. f) Referencing using APA style.